Home Decorators Collection Winterton Oak features muted greys on a creamy background, creating an incredibly realistic distressed oak decor. The look is rustic and reminiscent of the shore; the floor showcases the knots and cracks found in more costly reclaimed wood. The neutral grey colors are a top choice for classic spaces while the lighter creams will help brighten any room. HDC Grey Harbour Oak is the perfect floor for extreme levels of use. The high-density, 12 mm thick planks coupled with an especially wear-resistant AC3 rating surface make this floor suitable for light commercial use as well as active residential households. 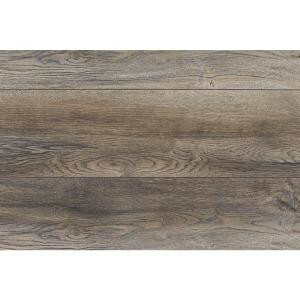 Buy online Home Decorators Collection Winterton Oak 12 mm Thick x 7-7/16 in. Wide x 50-5/8 in. Length Laminate Flooring (18.2 sq. ft. / case) HC01, leave review and share Your friends.